Every morning in a spartan hostel above Santiago de Compostela, hundreds of pilgrims prepare for the final leg of a long journey. With plasters on their blisters and bandages round sore knees they stream onto the street, rucksacks strapped to their backs and staffs tapping on the paving stones. Their destination is Santiago cathedral, built where Catholics believe the remains of the Apostle James were discovered in the 9th Century. It has been a place of pilgrimage ever since. But this year Santiago is on course to host a record number of visitors for modern times. To qualify for the "compostela" or certificate for completing the Way of St James, a pilgrim must walk at least 100km (62 miles) , or cycle 200km, and profess a religious motivation for the journey. "When I'm walking, I say I won't do again then something comes inside me and I have to," explains Pino Fusaro, a long-bearded Italian who is walking the way - or camino - for the third time. He once walked 2,700km to Santiago, from Nuremberg, Germany. "I do it to pray for freedom, in my heart and in the world. For a better world," the pilgrim smiles as he strolls. Pino says his only religion "is love". But for many, making this pilgrimage is an act of their Christian faith. "I'm hoping for a miracle," confides Raquel, a young woman from Madrid. "I have a relative who's sick and I'm making this sacrifice so their operation goes well." For others like David, the camino offers a cheap holiday at a time of economic crisis. But it is not an easy one. "The last 5km each day are horrible: your skin hurts, your ankles hurt, you just want it to end," David admits. "But you meet lots of people, and it's great fun." This year, 2010, is a Holy Year for the cathedral, marked whenever St James's day falls on a Sunday. Traditionally, that lends the pilgrimage special significance for the faithful. But it has also become a major commercial opportunity for the local authorities. 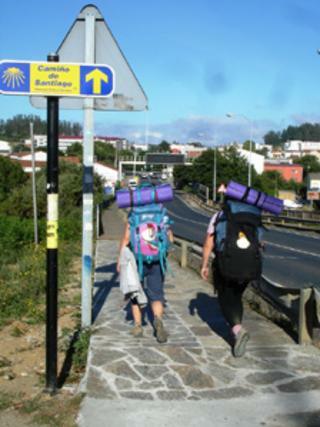 The regional government in Galicia first invested in promoting the camino for the 1993 Holy Year. The number of pilgrims - and other visitors - has risen ever since. "The camino is Galicia's main, unique product," explains Ignacio Santos, who is organising this year's pilgrimage-branded programme of events. "Promoting Galicia as a destination is very important for us. We use the pilgrimage as the heart of our campaign, but it has far wider reach now," he says. The programme for this Holy Year is bigger, longer and more widespread than ever in a bid to give Galicia's crisis-ridden economy a vital lift. Among the crowd-luring events are concerts by Muse and the Pet Shop Boys - hardly religious, but part of what is dubbed the "cultural pilgrimage" to Galicia. There is a "gastronomic pilgrimage" of food festivals too - events promoting the lush local countryside have also been branded for the Holy Year. The organisers argue the concept of mixing culture and Christianity is not purely commercial. "The camino is the backbone of Europe," argues Ignacio Santos. "The flux of ideas, culture and economics that took place on the walk were part of the formation of Europe." As well as promoting the camino, the regional government has built dozens of pilgrims' hostels since 1993 and signposted the official route. Its Holy Year campaigns have hugely increased the number of pilgrims - and non-religious visitors - to Santiago. In 1992, just 9,764 pilgrims completed the camino. This year 133,000 had already reached Santiago by the end of July. "Society is very centred on economic matters, there's a lack of spirituality in our lives," argues Pilgrim Office official, Maria Eiras. She believes good marketing is just one explanation for the rising popularity of the pilgrimage. "People are in touch with human values on the camino that they don't experience day to day. That makes it very attractive," she says. Other pilgrims tell her the camino has been a chance to reflect, at a time of personal - or economic - crisis. As for the pop concerts, galas and food festivals - the Church is pragmatic. "As long as it's understood that's the environment for the pilgrimage, not its essence, it doesn't disturb," Maria Eiras says. "The essence is the pilgrims' experience along the way. It's something more profound, more spiritual." Local businessmen certainly have no problem with the promotion. Eight new hotels have opened this year to cater for the surge in visitors. Jose Antonio Linares runs one of them in the historic heart of Santiago. His family used to run hostels for university students, but pilgrims are better business now. "At the end of the camino, many pilgrims want a room with a big bath," Jose says, revealing suites at The Moure offering just that. "It's like a premium, after all their suffering. I think they deserve it." When the pilgrims finally reach their destination, those aches and pains are forgotten for a moment as they celebrate. "I'm sad because it's all over, but it's been great," laughs Raquel, as she and her friends cheer and hug outside Santiago cathedral. As for Galicia, it is determined to embrace this opportunity to the full - because the next Holy Year does not come round until 2021.